Advocacy drives change. And change was all abuzz last week at the Central Florida Regional Leadership Forum in Orlando, Florida. 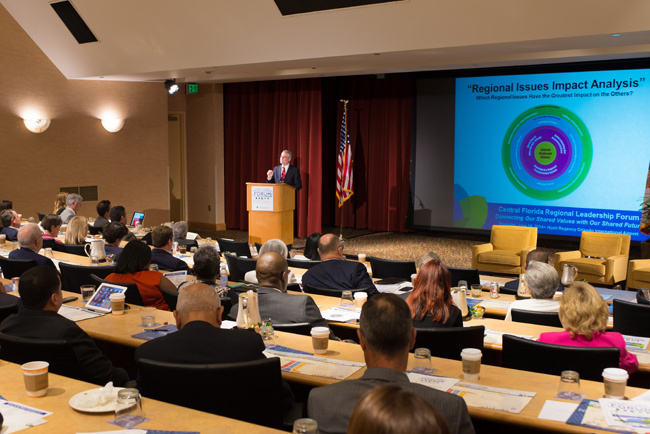 Hundreds of advocates and over 150 business and community leaders gathered to connect their shared values with a shared future. The event, was presented by the Central Florida Partnership and sponsored by the Orlando Regional REALTOR Association, in partnership with the Central Florida Foundation and MetroPlan Orlando. JDSA received a special invite, along with a host of other community partners, who spoke on updating their business plans to help Central Florida’s “family of communities” move toward a more prosperous future. Dee Allsop, Ph.D., CEO and Managing Partner of Heart + Mind Strategies, released the findings of a multi-phase research project to better understand the hearts and minds of residents of Central Florida. Specifically, as they relate to the values, priorities and future of the region. Click on the link below to view the report, Understanding the Values and Priorities of Central Floridians. A 2005 myregion.org’s initiative, entitled, “How Shall We Grow?” was what helped commission this latest study to better understand what, exactly, has changed over the last ten years. “With new developments and business centers being constructed across the Central Florida Region, it’s important for us to know if and how these dramatic changes to the economy have shifted the priorities and values of Central Floridians.” said, Jacob V. Stuart, President of Central Florida Partnership. The Central Florida Partnership serves nearly 4 million people throughout 86 cities in 7 regional counties: Brevard, Lake, Orange, Osceola, Polk, Seminole, and Volusia. We were proud to have been in attendance and are already engaged in working and Just Doing Something…Anything! with the leaders of each county. « Phixios Holdings: Just Doing Something to Bring Manufacturing Jobs Back to the U.S.